We have been working to get the first phase finished by the end of this year and we are on target for this. The first phase gets us a completely finished car baring the engine and transmission, in other words it will look the part but will not run under its own power. 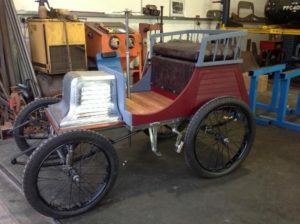 Currently the finishing touches are being put to the chassis and the body is at painting stage. Painting is hand brushed coach enamel and takes a great deal of time, I am on the undercoat stage having already applied three coats of primer. 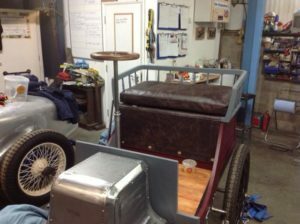 The upholstery is all complete. I will be away for a couple of months over the Christmas/New Year period so the final top coats may have to wait until my return. If you can wait a few days I will get all the various bits assembled and take a few photographs for you. I should be able to do this by early next week. Phase two is going to be difficult as we have to build a one off working engine in the image of Percy’s original. This seems an almost impossible task given the lack of information but Phil (my engineer collaborator on the project) is confident that he can do it. Let us hope that he is right! The other problem is that we have now run out of money so the trustees are going to have to think of ways of raising cash, a lot of it! We have until 2021, Coventry’s City of Culture Year, to get the money and build the engine and I would guess that we need at least another £10,000 so some serious fund raising is required. 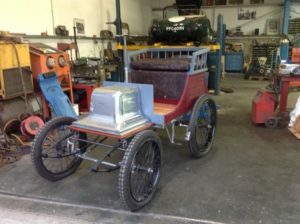 The car should be able to make the 2019 NEC Classic Car Show and if the special engine is still some way off by then I may be tempted to make one in wood with a battery inside and belt drive to the rear, just to get it mobile – the kids will love it!